There is a reason this is a best-selling book right now: it’s a good one! It is also a brave book. 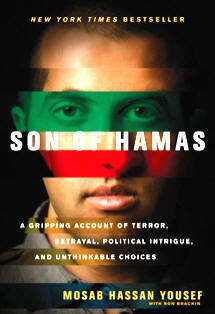 The author expresses his experience as the son of one of Hamas’ core leaders, his work as a spy for the Shin Bet, and his conversion to Christianity. His vulnerability for the sake of his message is outstanding and demonstrative of his love (God’s love through him) for all people. I was captivated by the spy aspect of the narrative, fascinated by his detailed recap of the groups and events within the Middle Eastern conflict, and especially touched as he presented the gradual transition of his heart from hatred toward the Jews to working with Israeli intelligence, then toward the Creator God and Christian faith. It is interesting to see God speaking through him and guiding him even before he dedicated his life to Him. It is also amazing to hear the testimony of the difference in his experience of worshipping God compared to Allah. Is “God/Allah’s” personhood defined by His name or His attributes? Yousef shows that Allah and the Christian God are distinct in their characteristics, thus are not the same. His experience with each are deeply felt by the attentive reader. I appreciate this story, and am excited to hear that there is also a documentary (The Green Prince) based on this story.